This web site isn’t about me. It’s about all of us. It’s our story – the world’s story – as told through food. when we understand one another. We must set a Global Table and invite everyone to sit down together as one family. Welcome to Global Table Adventure – a celebration of every country in the world – a place where I share the one thing that unites us and that drives our individuality – food. 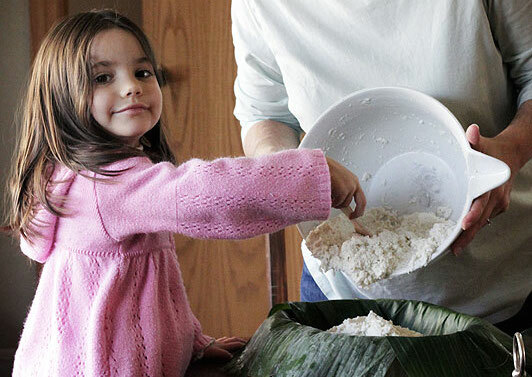 Each week my family and I dive into a meal from another country, learning about the food, trying recipes, and even sharing videos of my young daughter sampling the food (she’ll have eaten a meal from every country in the world before her fifth birthday). It’s the ultimate stovetop travel experience. We’re going A-Z so you can easily jump in at any time. Check out our schedule for details and our map to see where we’ve been. This web site is a pocket of peace – a place for positive stories and loads of recipes – you won’t hear about war, famine and devastation. There’s enough places covering those issues. I’m lifting my voice to spread the good, the happy, and the downright silly. And, yes, there’ll be tidbits about me (I’m Sasha) and my family along the way – my sweet husband Keith (read why we call him Mr Picky), and my lovely little girl, Miss Ava (read how she inspires me). If I can eat the world from Tulsa, Oklahoma, so can you! Join me as I share hundreds of recipes, photos, videos & reviews … In the process, you’ll learn how to enrich your own family’s meals while celebrating every culture. All recipes from the 195+ countries are free and available for home use, whether for school projects, family nights, or dinner parties; reap the benefits as you pursue the spiced life. Every week I select recipes that moms make all around the world with toddlers hanging on their shirts – not super weird, but always interesting. Even better, many recipes are complete stovetop travel experiences, not only including photos of the food preparation, but photos of the country of origin. Won’t you join the Adventure? You can share the love with our “Knight of the Global Table Adventure” badges. My cooking is in a deep, no longer passable rut. No one wants to travel on that road anymore, least of all me. Now is the time to give my taste buds some excitement! Now is time to let the beautiful world inspire me! My husband’s Picky Eater Syndrome is in remission thanks to much hard work on my part. However, I see signs that it might be rearing its ugly, boring head again. I have a theory that Global Table Adventure will cure him completely of this sad disease. My daughter, seven months old, deserves to grow up in a household where creativity, culture and good food are priorities. On a global scale, I want her to appreciate the world and respect other cultures; I think food is the best way to do this. Plus, I am afraid the Picky Eater Syndrome might be genetic (my step son seems to have an incurable case of it). I think if Ava eats a variety of food from around the world, she’ll have a great chance at being a good eater. Food in Tulsa. Yes, there are good meals to be had here, but I miss the variety of cuisines I experienced while living in Europe. In my six years abroad I sampled dozens of cuisines and none of them used Velveeta! Not even in queso. I got 45 new French Square spice jars for Christmas. I don’t want to be one of those people that just looks at their spices for years on end. I want to use them before they turn to dust. I should be having dinner parties on a regular basis. I like food. I like people. I even like eating food with people. Global Table Adventure is a great excuse to bring family and friends together around food. Lacking the resources to travel the world indefinitely, Global Table Adventure will whisk my family away for a mini vacation each week. I’m smiling already. And, finally, and most importantly, I believe we create peace when we learn about each other, when we understand one another. Let’s go eat our way around the world! And if you want even more reasons, have a listen to my NPR interview with Studio Tulsa. For thirty minutes I talk with Rich Fisher about why I’m eating food around the world and share unique “behind the scenes” stories. Enjoy! what a great, fun, creative idea! it reminded me of the movie Julia & Julie except with the international touch! look forward to reading more posts and recipes! Sasha, congratulations for your brilliant idea! I live in Brazil and i love cooking and travelling. I got really excited about this adventure. I wish i got your courage to do it, but i’ll certainly follow you from now on. Hi Sasha, I was able to take some time out today and browse more of your interesting and captivating blog. I am really amazed by the level of detail in each recipe and can feel the amount of time, research and practice you are investing behind each recipe. I am really impressed by your love for authencity. Really a great job. My heartiest congratulations and best wishes. I really loved the Lyulya Kabobs and going to try it. Please write to me when you start thinking about India as India has 28 different states; each state culturally diverse with it own unique cuisine. Thank you! I’ve appreciated your insight on Bangladesh. Personal experience is so valuable. I hope, over time, more people will speak up for their countries and help us all learn together. Found this via tastespotting.com. What an amazing idea! I am full of respect and admiration and more than a little hunger, looking through this blog. Congratulations and enjoy your adventure! If you need recipes from Brazil (I’m from Brazil), let me know! This is way too cool!! I have a few Asian recipes… under “cooking”. Great idea for a blog! But what will you cook for the UK? Or will you split us into England/Ireland/Scotland/Wales? I’ve thought about that and am not yet sure how to handle it. I think I’ll do one meal with a dish from each – and maybe after the 195 week challenge go back and do a full meal for each. There is so much good food, it is hard to limit myself, I want to eat it all! NICE WORK LADY!!! Really enjoy the idea and the recipes. It’s good for your baby to learn about eating…I did this with all my children and now (adults) they thank me for it. Thank you Anna. I’m glad it worked out for your children. 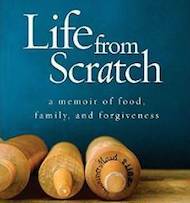 They really do pick up on our attitudes about food (and life) – and imitate. She’s already doing so great trying different things. I also love to travel and have learnt tons of recipes from all over the world, in fact if we don’t do Indian, Mexican or Asian every few days my kids start complaining! If you need recipes from Italy I’ll be glad to help… Italy really has a lot of very different cuisines, according to where you are (very feudal, still), in fact almost every one of the 26 regions has a very different style and flavour. I haven’t covered all 26 of them, but I’ve nailed a few good ones. Feel free to email if you wish, although I’m sure you have a few up your sleeve already…. Thank you for the wonderful work and inspiration! Hi Fabrizia! Your note made me laugh… but don’t worry, I won’t tell Flylady 😉 ha ha. I’m glad you enjoyed yourself! I’m another FlyBaby who found you! Love the idea of the site, I’m glad to have caught your adventure early on! I’m definitely subscribing and keeping up with it. Any chance you can enable the whole post instead of just an excerpt when subscribing in a reader? Hi Ina, I’m so glad you joined us 🙂 We have a few more years to go, so we’ll have lots of fun along the way. 😀 In terms of the subscription, I come out with a lot of recipes on Sunday/Monday and the digest format keeps it from being obnoxiously long. Hope that makes sense. I’m open to doing things differently, but I don’t want to overwhelm people. i’m another flybaby! love this concept. think taste it tuesdays might become part of my families life now. =raises hand= … You’ve got yet another Flybaby here … Like the others, I love the concept and will be a regular reader. I’m an Army Brat ((or perhaps that should be “former Army Brat” … Is one still considered an Army Brat after half a century?)) and my parents raised their kids to be accustomed to the foods of more than one country. =grins= This was in large part because my father refused to give up *his* favorite ethnic foods just because he’d come back State-side. Every place he got stationed he’d end up sweet-talking the head cook into giving him a recipe or two so that when he went back to the States, he could teach his wife how to make his favorite dishes … since he couldn’t take the *cook* back with him. This never seemed to fail – not even with cooks who never gave *anyone* their recipes. Luckily, Mom not only loved to cook she loved trying new recipes, and I’ve followed in her footsteps. I’m looking forward to trying as many of the recipes here as I can locate ingredients for. What a great website! I spent part of the afternoon reading up on all the countries you’ve tried so far. Such yummy looking food! I can’t wait to see what you do next! I love this idea. I had once thought about trying to do this same project in a year. I think the way you are doing it is much better, not only providing recipes, but information about the countries as well. I think this will be a super fun project, but a lot of hard work as well. I look forward to following your progress. I’ve been following you for almost a year now and I just have to tell you-THANK YOU, DONT STOP! This is an amazingly ambitious idea! Does it ever get expensive or do you find that after a while you tend to have most of the things you need? Hi Becky! Yay! I’m so glad you are enjoying our Adventure 🙂 The real expenses are meat and spices. The spices I pretty much have covered now. Meat isn’t too bad, since I’m usually just buying a pound or so. The other thing is grains – and, if I don’t use them much, I just store them in the fridge/freezer. This keeps them fresh for a long time, so I don’t have to buy them over and over again. Thank you for the encouragement! Keep in touch. My momma, Jerry Sills (Marie’s sister) passed on your facebook via Keith’s mom, yesterday. I wanted to send you a message but can’t find a way other than here so. . . . It’s always good to meet a cousin and your project sounds like a lot of fun! I will be following along. So remarkable–yesterday I was just Looking at you!!!! I was cleaning out my photos and I had these pics of you when we sent you back to Europe (14 yrs old!). Do you remember I asked you how to say something in Lux and you told me it meant one thing, but meant another, and the nosy guy behind us almost fell out of his seat!!! Still don’t know what clever thing you made me say! What a fabulous idea and blog. Do you have a list somewhere of the countries you’ve already visited/cooked from? Compliments for the original idea of yours, never heard anyone to mention any idea like yours. You seem to be very creative…your husband is very lucky to have you and of course we are lucky too. I amKosovo albanian…I saw some recipes related with albanians. you meant Albania the country or albanians in general, cause here in Kosovo we have some good meals that maybe you should try it…I cook a lot , I love cooking…if you ever pass around here (Prishtina) you are very welcome to come and try some real Kosovo meals. Hi Besa, that was for the country, Albania. I’m looking forward to trying the food from Kosovo as well. I’m going alphabetically, so I’ll be in the K’s eventually 🙂 Keep in touch! I just found your blog and I am totally captivated by the concept. I will dig deeper into the recipes and tales soon. 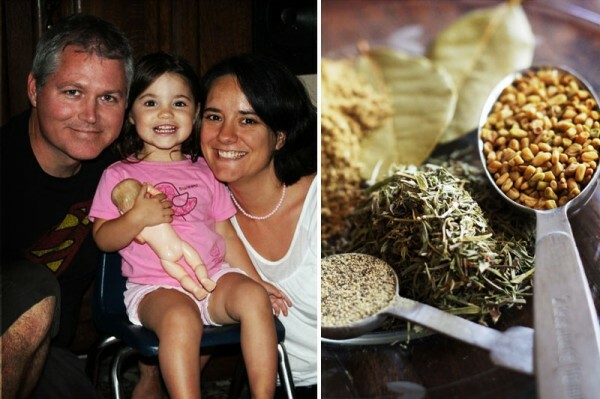 I totally love the idea of traveling with food, and educating your daughter to different flavours. I can’t wait to eat more with you! Yay! Thanks for joining the Adventure 🙂 Keep in touch! Thanks 🙂 Finland was deeeelicious 🙂 Looking forward to Poland as well! I just found your blog and I can’t tell you how much I absolutely love the idea behind it & the way your cooking! Kudos to you! I can’t wait to look back at what you’ve been cooking up and following along with what’s to come! I love this idea, sorry I just got on board now. Will have a lot of archive reading to do. As an American living in Italy with two small children, this totally appeals to me and my love of all foods. 🙂 I’m so glad you found us.. it’s been so nice having you as a regular reader and I enjoy all your comments ! Ohh, I hope it came out well 🙂 I’m glad I was able to help! Such a neat idea!! I totally love this! I always thought as well that there were 195 countries in the world, but my blog alone already had visitors of 204 countries in the world… so maybe the UK is one country to get to that number of 195 but on my blog they are listed as 4 countries?? But anyway, a great idea and I totally LOVE the videos of AVA, she is adorable!! And already such a good eater!! Cheers from South Africa, and if you ever need a recipe… email me! Thanks for your note 🙂 Glad to have you join the fun. Ava’s doing well – she has bouts of pickiness from time to time (like any 2 year old), but that’s to be expected ha.Those traffic sources often list territories and other places as countries. I’ve actually included a couple of questionable ones, just so I can eat more. And I’m pretty sure an extra country or two will exist by the time I’m done 😉 Anyway, glad to have you, all the way in South Africa – yay! when we understand each other. We can’t create peace alone. Do you mind if I quote you in my blog? I have just discovered your site via the post on La caffettiera rosa and feel totally enthusiastic about the fantastic journey you are sharing with us! The choice of recipes and the tips are great, your pictures are beautiful, but what I like best is, the loving and peaceful energy behind it. I just want to say I LOVE your website and your adventure. I am working on an ESL text book, and would like to include a reading ( I am writing) about your project. I want use your name, but would love to highlight your project for my chapter on count/noncount nouns. Hi Sasha, I think this idea of yours is really unique, original, and just amazing all at the same time. Takes a lot to learn a cuisine each week and set yourself this goal! I’ll be back…great work so far! I love your blog! Your food pics look good enough to eat off the screen, I LOVE the concept, writing and videos. I’m a graphic designer who art-directs photos and websites, etc., and know how much work and talent it takes to produce your project, especially week after week. I am also a fan of foods from all different cultures. I’m lucky to live in the SF Bay Area where we have a huge array of cuisines to choose from every day; my kids are extremely open-minded and will try just about anything. I’m happy your idea is reaching many areas where there aren’t many of such opportunities. I have yet to try one of your recipes, but will soon! — An appreciative fan. Bev, you’re a doll! Thank you for sharing such a wonderful review. Your encouragement means so much. I hope you report back on whatever recipe you do try with your kiddos – there’s so many fun ones to explore. Finally, I appreciate YOU! Thanks for bringing a smile to my day. This is a great site! I’m going to share it with some of my fellow “third-culture kid” friends, who like myself, would like to expose their far less nomadic American-born children to international cuisine and culture. Thank you Danielle – you are wonderful. Such a fantastic idea, looking forward to more of your posts and sharing them with my kids! This morning, while still in bed, our alarm-clock-radio (which is regularly set at 6 AM, on NPR-affiliate local public radio WHRV (Norfolk) on 89.5 FM) sounded off, and as usual at 6 AM on Saturdays, the first radio program I hear or listen to is Travel with Rick Steves. After his interview with Steve Innskeep of NPR’s Morning Edition, discussing about the state of journalism and news reporting in foreign countries, Rick Steves (who’s based in Edmond/Seattle, Washington) talked with you next. And, listening to you talking about one of your passions or shall I say your “brainchild” which is Global Travel Adventure, I immediately rose up from bed and logged on to my laptop and visited your website for the very first time. Surprised I was to find out about your gastronomical global adventure with your family. Such a passion of yours! So impressed I am by what you and your family are doing to make a difference in promoting peace throughout the world. Kudos to you and your family for all your efforts and endeavors. I commend you for such a feat. Keep up the good work. Best regards to your #1 critic and best food taster, your daughter Ava. Take care. May God bless you and your family always! Happy, Healthy and Lucky New Year! Thank you so much, Chris (a.k.a. Fernando)! 🙂 What a wonderful message… You are a fantastic writer and have thoroughly made my day. I’m not sure whether to be happy or apologetic that I made you get out of bed early on a Saturday morning, though. Ha. Please keep in touch! Happy cooking and best wishes for a wonderful year. Sasha, I, too, heard you on NPR. I had gone to get gasoline & a sandwich, in Tulsa, at lunchtime yesterday. Just as I pulled into the gas station I heard you say “Sasha in Tulsa.”. That made me wait to exit the car and I was oh so glad I waited. Then, I had to repeat ‘globaltableadventure.com’ over & over in my head while I picked up my sandwich & returned to my office. When I saw your website I was amazed by your comprehensive work. The only thing I could do was bookmark it for later. It is later & I’m a tad overwhelmed as a ‘nothing special’ kind of cook. Nonetheless, your adventure and philosophy have captured my interest and I’m searching for a place to jump in. Thank you so much Shelley 🙂 Especially for waiting to get your lunch while you listened… lol. That would be the hardest part for me! As for cooking, there’s usually at least one easy recipe per country (just yesterday I made applesauce for Liechtenstein. Another good place to start are the drinks.. usually *extremely* easy and fun. Best wishes and keep in touch! I heard you on Rick Steves today and immediately went to check out your website… even before you were finished talking to him. What a wonderful thing you have done!! May all of America… nay… the whole world find your website and come to know each other through this fine gift you have given us. Thank you so much, Robert – I’m thrilled 🙂 I have the same hope as you, that we can all come together and celebrate each other. All the best to you and yours. I just listen to your radio interview & I think you are fabulous. I was inspired by your creative positive outlook. Your daughter & husband are very lucky. I plan on following your adventure & being a passionate cook myself will cook along with you. Here is to peace, love & family AND good food! Tanya, you’re message is so uplifting, thank you 🙂 I’m thrilled you’ll be cooking along – and I’ll *definitely* raise my glass to peace, love, family and good food. Happy cooking! Heard you on Rick Steves the other day. Love this!! Can’t wait to explore your website and I completely agree about peace around the world around a table. So great. Thank you for doing this. Ha, yes 🙂 Nice to meet you, too! Welcome Mary! So glad you found your way to our little Adventure (from Tulsa, even!). I wish you the best of luck – the more you cook like this, the more your son will come around, even if just with nostalgia later in life. BTW-Do you have a list of some of your favorite international markets in town? I too am a regular at the farmers’ market and have really worked to have the family eat seasonally this past year. We are loving the root veggies right now. There’s a neat African market on 61(ish) and Lewis called “Ebute Tropical Market), of course Nam Hai, the Korean Market (google should find it for you), and I like the small latino market just south of I-44 on Peoria (it’s pretty new and has a decent selection for the Brookside crowd, although there are larger)… there’s an Indian market on 41, behind Panera, a Middle Eastern market on the SW side of 51 & Yale… and so many more! I just found your blog and couldn’t wait to dive in! We are a homeschooling family and we just finished our “letter of the week” series and each week we celebrated “World Wednesday” where we “traveled” to a country that began with the letter of the week. We would learn about , watch videos from and make food from each country we “visited”. I wish I had known about you and your blog before, but now that I’ve found you I’ll be visiting often. I have even started a mural on our living room wall where we paint each country we “visit”. It’s an amazing lesson in culture and geography. And it’s so much fun! Thank you for sharing your vision! Wishing you happy, tasty trails. We have been enjoying fish tacos for lunch this week ( We meaning us and our Ava!) They’re a restaurant favorite of my husband, and now they’ve made it to our family dinner table. That’s how a lot of new flavors come to us. I can’t say what country this would be from though. I imagine many, it seems to just be catching on in the U.S. It was quite plain, as is our usual for us for a first start, but we’re ready to dress it up a bit! Out of 300 blogs in my Reader….this one is simple the BEST! I came across your blog and I just had to say I love the idea! I don’t cook a lot right now and I don’t have a family, but I love to travel and think this would be a really great way to share an interest and appreciation for international cultures with my future children, even if we don’t have the budget to go. Hi Sasha – Great blog and what an adventure! I was wondering if you can also share your sources for the recipes. It would be really wonderful to also see the original recipes. wow such a cool foods site! Love it! 😀 and your daughter is cute! I’m from Luxembourg, I was surprised reading that you spend some time in this country, really cool !! I discovered your webpage some months ago and since I adore your idea, I love the idea of travelling and cooking, it’s a great adventure. Sometimes I ‘m trying some of your recipies, and it makes me trying more and more of them, it’s big fun! I wish you a great time carrying on your big travel around the world. Just heard your interview on Travel with Rick Steves and love the idea. When your daughter is a bit older, be sure to read “The 21 Balloons” by William Pene Du Bois, winner of the Newberry Medal in 1947. It’s an exciting story that includes a community of families who organize their society around cuisines of various countries and cultures. Best wishes and bon appetit! I love your idea of posting recipes from A to Z, excellent website. I came across looking for the mongolian milk tea, then I noticed the bissap tea which looks intriguing, although, I have about 2-3 glasses of Karkaday tea everyday this looks interesting with ginger and vanilla. Gotta try this one. Wow, this is an absolutely amazing thing that you are doing! So many people in the world should to travel and experience culture, especially in the form of food. So glad to have found this website, bravo! Heard about your blog on Facebook through Yummy Recipes. Love, love, love this idea! Kudos to you! Can’t wait to explore more of your site and try some of the recipes. This site is amazing! I’ve been on the same quest albeit at a much slower pace and finding your recipes has greatly simplified the task. Thanks! I am so glad that I was given your site. Cooking is my relaxation and I love this idea! My 9 year old daughter chooses the country and we cook the entire meal every week. As a single mom, this gives my daughters and I some valuable time together to experience the world while living in Tulsa. I am hoping it helps make my youngest a less picky eater as well! How wonderful! And you’re right here in Tulsa, too. How fun 🙂 I hope you come on October 12 to Philbrook – we’re doing a big event “The Global Table Experience” 🙂 You’ll be able to sample 160+ recipes from our Adventure, prepared by local chefs, schools, and organizations! I plan to be there! We love the Philbrook and love good food. What a great combination! As a home educator I am so excited to have found you and your adventure. My younger children and I have just begun an official study of geography, and we plan to take our time studying each continent fully. As I looked up Ethiopian food on youtube, I discovered some of your videos. This will truly add such a special dimension to our study of this wonderful world God has made! Thank you so much for sharing your adventure and helping us as we study the countries of the world. Karen, I’m so glad you and your children are joining the adventure! Best wishes and hugs! What an amazing blog Sasha. I love everything about your blog and cannot wait to explore all the delicious recipes. I found your blog through another blog that had listed yours among her favorites and I can see why. 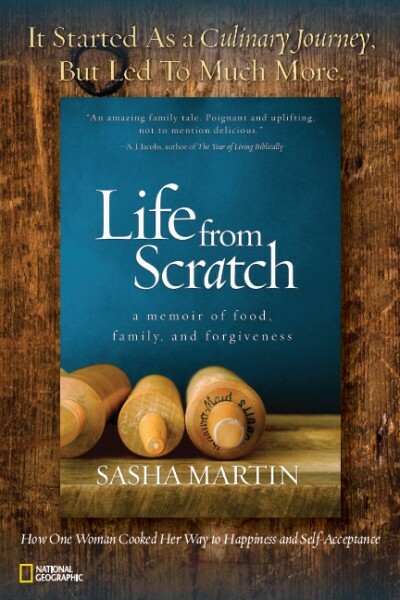 I’m reading your book right now “Life from Scratch” so I looked up your blog. It looks wonderful, I can’t wait to start trying some of these recipes. Yes to all of your reasons! So happy I found you! Hi blogger, i’ve been reading your website for some time and I really like coming back here.